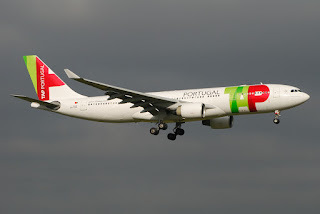 TAP Portugal has officially announced that it has signed a deal with Airbus for the procurement of 53 new aircraft that will see the airline commercially through the entire 2020-30 decade. The breakdown of the order is 14 A330-900s + 15 A320NEOs + 24 A321NEOs. Previously it had ordered 12 A350-900s which were in turn exchanged for 14 A339s as TAP's internal studies revealed it was cheaper for them overall to operate the A339 versus the A359 whose extra flying range was not required for any destination in its current and future network plan. The A321NEO order will be split between the normal NEO version and the LR version which TAP has stated will be used to fly on medium demand trans-atlantic routes from Lisbon to U.S. East Coast and Northeast Brazil. The cities identified for this purpose include Boston, Toronto, Montreal, Washington DC, Bayeux, Parnaiba and Aracaju. The configuration of these A321NEOLRs will see 16 flat bed seats in business class plus 159 in economy totaling 175.